Vinex Skates are designed with Gravitational Torque Technology that utilizes a center-mount to enhance a skater's center of gravity and the body position. These skates gives you a comfortable and fun skating experience. The carbon steel ABEC-5 bearings of these skates give you better precision and efficiency along with added speed. 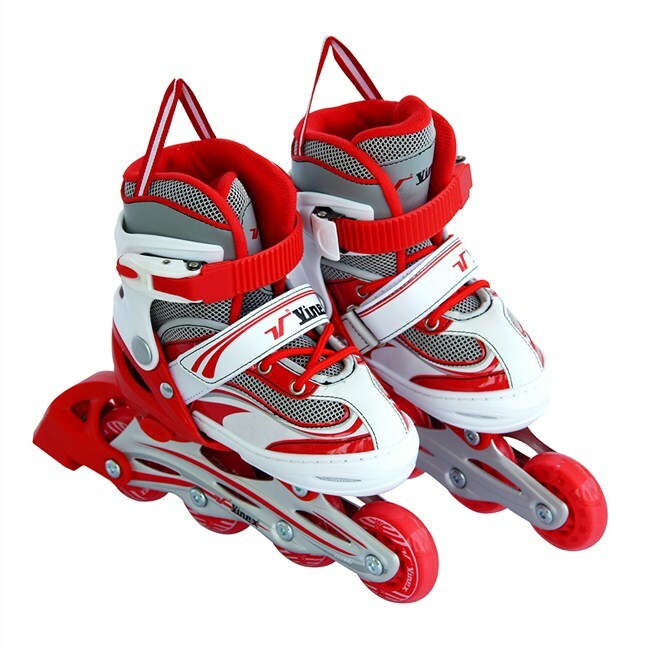 With a Plastic chassis, these Skates are durable and sturdy, thus gives more speed and less power. Vinex Skate's boot has a higher cuff then most speed skates, improving leg and ankle support. The comfort foam with reinforced ankle support with power straps offers comfort, stability and a good fit. These skates also offer the convenience of adjustability. To enlarge the skate, just press the PUSH button and slide the toe box forward, so don't worry for increasing foot size. Wheels are easily replaceable when required to be replaced with new one, allowing it to be used for years. 3. Liner: Mesh, Velvet, Foam etc. 5. Bearings: Carbon Steel ABEC-5. 6. Wheels Material: PU Casted. 7. Wheels Hardness: 82 A. 8. Wheels Size: 60 x 24 MM. 9. Skates Size (Small): 27 To 30. 11.Designed with Gravitational Torque Technology. 12.Perfect Ventilation for Comfortable and Fun Skating Experience. 13.Brake System for Safe Skating Experience. 14.Stylish Design and Available in Red / White Color. 16.Includes in Package: One Pair of Vinex Inline Skates - Stylus (Adjustable, Red / White). Inline skates offer numerous advantages when it comes to exercise, most notably, it is not boring! Skating is a fast-paced, exciting activity that offers a lot more than your treadmill or yoga ball will. Furthermore, inline skating is a low impact activity that will generate little wear-and-tear on your joints and bones. Also, inline skating can burn as many calories as running. The list of benefits is long, but the bottom line is that inline skating is a great fitness activity. If you plan on using your skates to get in shape via long, fast skating adventures, then Vinex Inline Skates are likely the best option for you.